I’ve read several of Mark Schaefer’s books – Born to Blog (see my review) and Toa of Twitter. And I’ve loved them all. Return on Influence is no different. I considered Return on Influence for my fall 2015 social media class. But ultimately decided not to use it because I had 2 other great books I wanted to use: Likeable Social Media and Your Brand: The Next Media Company (Thanks to Karen Freberg for bringing Your Brand to my attention). Still, I think it is a great read and recommend it for a class. In fact, two of my students have read this book and both highly enjoyed it. There’s a high chance I will be implementing the book next Fall. In ROI, Schaefer explores the notion of the citizen influencer and how social media has empowered everyday citizens. While we’re all familiar with this concept, the book explores the concept of influence with an aim to help one understand why we’re influenced, the type of person who influences us, and how influencers can be identified and leveraged. Schaefer does the reader a solid by reviewing Robert Cialdini’s seminal work on the subject of influence, Influence: Science and Practice (Cialdini’s book was a favorite of mine in college. I highly recommend it). Specifically, Schaefer explores authority, likeability, consistency and scarcity, as well as social proof and reciprocity. He relays how these concepts relate to “your personal power and influence” online. Towards the middle, Schaefer delves into the controversial industry of influence scoring, focusing primarily on Klout. He looks at the spark behind the company and provides a history of how the company came to be. Klout was an idea that few believed in when it was conceived. Klout helped usher in a new era of influence marketing – the primary focus of the book. While influence marketing grew up with Jell-O and Tupperware, quick, easy, accessible social scoring by Klout and its competitors have proven a game changer. From TV shows to cars – the author provides several cases of companies harnessing Klout to identify influencers in a specific market niche, build relationships, and drive desired outcomes. Best practices are discussed. There are some very creative examples here and Schaefer helps the reader see just how powerful citizen influencers can be. Of course, we’re all wondering – how do I raise my Klout score? Schaefer explores factors that influence Klout scores, those that try to game the system, how the system has evolved in response, and the pros and criticisms of how Klout scores are ranked. In fact, a healthy portion of the book is dedicated to exploring criticisms and shortfalls with social scoring. After all, social scoring is still very new. The book ends with an exploration of the future of social scoring and some sobering thoughts on potential societal impacts of social scoring, asking whether such a system merely perpetuates of ‘rich get richer’ mentality. Are we but the total of our Klout score? And if we are, is that a good thing? 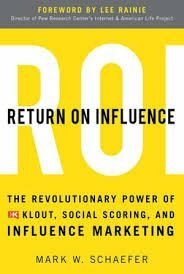 While buzz around Klout and other social scoring services seems to have died down a bit, there is much to learn from Return on Influence. Whether our students go on to use Klout scores to identify influencers or not, they stand to benefit from understanding the vital role of influencers in diffusing innovations on today’s social web. If you participate in the Hootsuite University program, you can teach students to search Hootsuite by Klout score. Reading this text would greatly enhance their understanding of how Klout works. As my students know, I’m a Paul Lazarsfeld fan! I discuss the notion of opinion leaders and the two-step (multi-step) flow of communication in my more introductory courses. I discuss diffusion in my social media class. And my campaigns students identify key influencers as part of their projects. As such, ROI is a natural extension of this part of their education, bridging tho idea of opinion leaders with the social web. In fact, I’ve discussed online influence and social scoring in my social media class. But students have expressed that they struggle with this concept. In this way, the text would add a great deal of value. Lastly, throughout the book, a number of other familiar topics such as social capital and the strength of weak ties are discussed that may help students gain a better grasp on these subjects. I believe these important concepts of social networks are foundational knowledge in a social media class. Taken together, Return on Influence is a great read for anyone wanting to learn more about the world of social scoring and its role in influence marketing today. 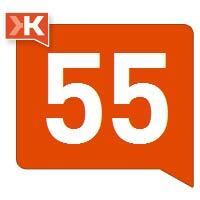 What are your thoughts on Klout and social scoring? Born to Blog author talks social media challenges, opportunities, and more! I always learn so much from our guest speakers! This week we were very fortunate to have the author of our class text, Born to Blog, Mark Schaefer (@markwschaefer) Skype with our class. If you aren’t familiar with Mark, he is a very well-known name in the social media field, author of the popular Grow blog, a sought after consultant, and the author of Born to Blog (a book I’ve reviewed on this site and which inspired me to start this blog), and another great book I’ve read Tao of Twitter. I haven’t read his 2nd book, Return on Influence, but I hope to soon. Here are some highlights from his presentation to this semester’s Comm 322 Social Media class. Challenges and Opportunities in Social Media – Mark said that a major challenge today is information density. Today, we have so much information that people are reaching information paralysis. How do companies adapt and thrive in this space, with so much competing for our attention? Though not specifically about information density, the article “How the physics of social media could kill your marketing strategy” offers what I believe is a good look at the general issue. Why do some businesses succeed on social media and others fail? Mark said it really boils down to corporate culture. Questions that come to mind after hearing Mark discuss this topic are: Does the company understand and embrace the social space? Are they agile and responsive? Do they want to adapt? What Metrics Matter? : Since I’ve been seeking to teach my students basics of Google Analytics, the importance of, and how to track metrics, I ask guest bloggers what metrics matter to them. When asked what the key metrics he tracks are, Mark said there was one that matters: returning visitors. Are they coming back? If people come back, eventually they’ll bring their friends. Traffic doesn’t create business benefits. Returning visitors do. We’re All Students – the media landscape shifts so rapidly, it is difficult to be an expert. We all are students. And we should strive to keep learning and adapting. As a professor, I loved hearing this reminder. I am always looking to learn, change, grow, and adapt and it is great to hear someone with as much experience as Mark talking about the importance of being a lifelong learner! The Power of Blogging for Students – Mark echoed another class guest, Nate Bagley, when he encouraged students to blog, build an audience, and create meaningful content. He said that it was a valuable tool to show potential employers that you can build and sustain an audience. He said that often times he finds students or grad students are not blogging, and was glad to see students in our class were blogging as a semester long project. I was, of course, very happy to hear this. 🙂 So students, if you’re reading this, keep blogging! Know Stats – Mark said education in stats is important. Increasingly, data and numbers are driving online business. You don’t have to be an expert, but you need to be able to ask questions and the ability to think critically, and choose the statistical analysis needed to answer those questions. While many students were probably grumpy to hear this, I agree completely. Stats and research methods are more important than ever. It is not often that students get to speak directly with the author of a class text, and it meant a lot to me for students to get this wonderful opportunity. So thank you so much to Mark for being so generous with his time and knowledge! I owe this blog to the book Born to Blog: Building Your Blog for Personal and Business Success One Post at a Time by Mark W. Schaefer and Stanford A. Smith. For some time before starting Social Media Syllabus, I’d thought about blogging again the way I think about getting back in shape to play lacrosse again or making homemade bread like Kelin and I used to – as a distant and improbable ‘wouldn’t it be nice’ scenario. I had started a blog briefly in graduate school, but being too busy, I shut it down. And honestly, my first blog lacked focus and intent. I hadn’t really thought through who I was writing to and why they should read my blog. I just wanted to blog and so I began. Needless to say, it didn’t go anywhere. Isn’t that the case with so many blogs? A roadmap for planning, launching, and maintaining a successful blog. The first part of the book focuses on motivating the reader and explaining what it takes to become a successful blogger, emphasizing the 5 common types of bloggers: dreaming, storytelling, persuading, teaching, and curating. While the book isn’t quite as in-depth in terms of offering advice on how to create a content plan and calendar as Content Rules, it offers a great overview and enough to get you started. The authors do a strong job in the middle section of the book tackling important issues surrounding finding and nurturing blog contributors, developing a content plan, uncovering valuable content within your own company your readers want, and more. Readers should keep in mind that this is a shorter book tackling blogging specifically. I would recommend Content Rules, a book we’ll be using in my Writing Across Platforms class, as a supplement to this book. I appreciate the emphasis on the theme in this book that blogging is a journey of personal growth. As bloggers, the authors remind us that we cannot expect to be perfect. We are constantly growing, learning, and hopefully improving. I have used Born to Blog as a guide and have turned to the book on many occasions for help with questions I’ve had along the way. if you’re looking to get into blogging or improving an existing blog, whether personally or for a business, I highly recommend this book. I plan on using it for my social media class this upcoming fall (see social media syllabus. You can also learn more about the class) as the text for our class semester-long blogging assignment. I hope the students will find it as approachable, motivating, and informative as I have! Do you have any great books you recommend for bloggers? If you’ve read Born to Blog, what did you think? If you enjoyed this post, please share. Cheers! The great thing is, the relative shortness of a semester enables constant innovation. Having taught social media for a number of years as a standalone course, there are a few things I plan to change for this upcoming semester. When I first taught a social media class, I taught it as a hybrid class, half in person and half online. Our major project that semester was the #UVUSOCIAL speaker event featuring Cory Edwards of Dell. Last fall I taught the class based on the team-based learning teaching model (Here’s the syllabus). Students completed in class modules and at the end of each modules completed in in class project designed to put to test the various things they learned during the module. The projects were applied scenarios and students were forced to analyze situations and solve problems over the course of two class periods. While this approach had many benefits, I felt somewhat limited by it. UPDATE: A copy of the syllabus for this social media class is now available as 1 of the resources on this blog! Hootsuite University program & Certification – We’re participating in the Hootsuite University Higher Education program, and students will get “Hoostuite Certified” via their exam certification process. Last semester we used Hootsuite in the class, but weren’t part of the program. t love Hootsuite and am super excited to be a part of this awesome program! It will be a great resume builder for the students. Metrics – While we touched on metrics last semester, this semester students will get a chance to set real goals, monitor their very own traffic (as opposed to hypothetical scenarios), etc. Optimization of Posts: Days and Times – Last semester I talked about this quite a bit. Students even read Zarella’s Hierarchy of Human Contagiousness. This semester, students we will discuss the topic and provide some examples. But instead of doing exercises, students will use a modified version of Professor Jeremy Floyd’s social media metrics spreadsheet to track their posting schedules and see what days and times are most effective. Thanks to Jeremy for sharing this awesome tool! Social Media Audit – Last semester my Politics of Social Media class did an in-class social media audit activity of an organization we were working with. I was also planning on having them complete a full social media audit. However, due to how busy we were working on our #ACFF12 campaign, that never happened. So this semester in Comm 322 Social Media, students will complete a social media audit on a brand of their choosing. Infographics – More and more it seems that visual storytelling is what’s winning on social media. I was considering integrating infographics into the Writing Across Platforms class I’ll be teaching next semester. Unfortunately, there is just too much to cover into writing class. I’m going to have to do the project in the social media class instead. Lastly, A New Book – I’m dropping Zarella’s Hierarchy of Human Contagiousness, and adding Born to Blog by Mark W. Schaefer, a great companion for the blog project and 1 of the books from my social media book summer reading list. What do you think? What recommendations do you have? I hope to finish up planning for the class this week and to get a copy of the syllabus up sometime soon. I also plan to offer some more in depth explanation of some of the projects and topics I’ve mentioned in this post. If you are teaching a class on social media, what are you planning to cover this year? 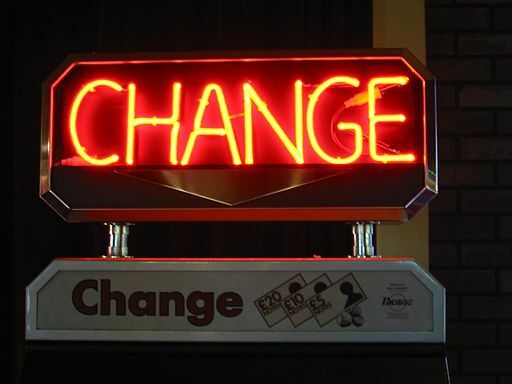 Are you making changes from previous semesters? If so, what? Drop a comment in the comments below or shoot me a Tweet (textbox on the right)!